Fresh from the garden to you. There is nothing more straightforward or more delicious than a sun drenched tomato and cucumber salad. Lime juice enlivens the flavors of the vegetables while a heavy drizzle of good extra virgin olive oil, smoky black lava salt, and baby basil are a flawless finish. This salad is the perfect canvas for a variety of finishing salts. As they gain popularity finishing salts are becoming easier to find, and if you do not want to commit to one flavor they often come in an assortment (like this gorgeous set from Williams-Sonoma). 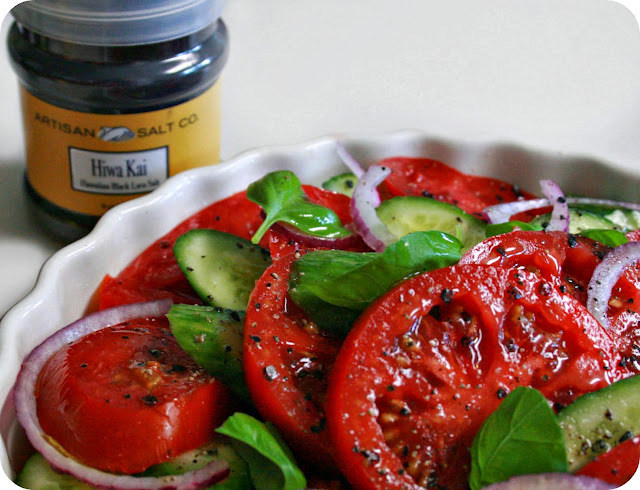 Try Hawaiian black lava salt if you are pairing this salad with grilled meat. The secret is fresh ingredients. It will not taste the same if you use tomatoes that have been hiding in the fridge for a few days. Prepare this with tomatoes from your garden or your local farmer's market. And for the love of all things sacred, please do not store your tomatoes in the fridge. Perfect, juicy tomato tip: Keep them on your counter, stem side down, and try to avoid piling them. The less tomatoes touch one another the better.You will thank me for these tips after you eat this salad, and shed a tear for all those bad tomatoes you never had to eat. On your favorite medium sized platter, layer the tomato and cucumber slices in a circular pattern one on top of the other. Sprinkle with thinly sliced red onion, a handful of ripped basil, and lime juice. To finish, drizzle liberally with extra virgin olive oil, cracked pepper and black salt to taste. Enjoy at room temperature. Perfect paired with grilled meat, poultry or fish. I love the simplicity of this - the summer product is so sweet thanks to the extra hot weather. It really pays to just let the flavors shine! Simplicity is my life in the kitchen these days. This time of year I can't fathom complicating these gorgeous natural flavors. The trick is just letting them speak for themselves! Awesome salad. I want it again today. Your salad sounds amazing and looks gorgeous! I have to say the lava salt is something I have never heard of before. Very interesting! Have a fabulous week! A simple and gorgeous summer salad! This is such an interesting combination, adding the lime juice. Hmm....I need to try this. I am a total sucker for nice salt. And the tomato tsunami is coming. Excuse me while I go run to Williams Sonoma. I've never had black sea lava before. The tomatoes look AMAZING and the whole salad is making me drool. I am just salivating, Kimmi! How I'm longing for some juicy garden tomatoes...and this looks like the perfect recipe in which to show cake them. And I'm going to have to keep an eye out for black lava salt! Wow, that looks so fresh and colorful! I do have some black sea salt and will play with this as soon as I can get some decent tomatoes. So I've seen black lava salt on Chopped and have been so intrigued to try it. I'll have to now!! Well, what do you know? I just got some black lava salt as a gift, and wasn't sure what to use it on yet! We have a winner...ding ding ding. What a gorgeous presentation and beautiful bright red tomatoes. There is so much to love about this! I have fresh tomatoes and cukes growing. And a collection of finishing salts I'm always eager to use! Simple and delicious! I love tomatoes, nothing is better then summer vegetables! This is simply gorgeous. I must say your header makes me smile too. It's just so pretty. Mary, that is so kind of you to say. Thank you. I hope you have a wonderful weekend. Oh I want to try black lava salt! Sounds fun and delicious. :D Very simple lovely salad!